The streak is broken, and it happened in the most dramatic of ways. What else can you expect from the UM-FSU rivalry? The No. 13 Miami Hurricanes have defeated the Florida State Seminoles 24-20 on a 23-yard touchdown pass from quarterback Malik Rosier to receiver Darrell Langham with six seconds left on Saturday evening at Doak Campbell Stadium. This gives the Hurricanes their first victory over the Seminoles in eight years. The Canes found themselves down 20-17 with just 1:24 left in the final quarter after Noles freshman quarterback James Blackman found his receiver Auden Tate in the end zone for the score. The pressure was on. The crowd was loud. It all came down to this. Rosier had a miserable first half, completing just five of his 18 passes and missing his targets every which way. 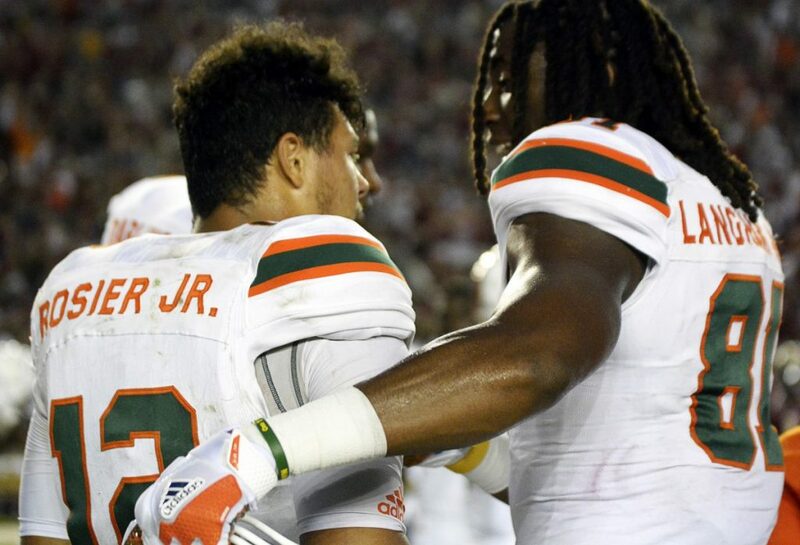 But all that matters is how you finish, and Rosier finished like the resilient quarterback that led his team to three convincing victories to start the season. And he got a huge help from his offense on that final drive. Sophomore running back Travis Homer, who was in for the injured Mark Walton, made two first down runs to get Miami in field-goal position. Senior receiver Braxton Berrios made two catches for first downs to keep the drive alive and give the Canes a chance to score. And, Langham, a redshirt junior who played just two snaps the entire night, closed it out on a leaping grab-and-roll into the end zone. Canes at home explode in celebration at the Rathskeller watch party Saturday evening. Just like that, UM makes history. That’s rivalry football at its finest. “You’ve gotta make the plays in big games like these – you’ve gotta play physical,” head coach Mark Richt said. Earlier in the week, Berrios called the losing streak to FSU “inexcusable.” He did something about it, making every big play to keep his team ahead. He racked up 90 yards on eight receptions and scored two touchdowns. He also made the catch on third down that set up the game-winning touchdown. Without that catch, Miami would have had to make a lengthy field goal just to tie the game and bring it into overtime. He didn’t let that happen. Plain and simple, Berrios was the Hurricanes’ best player on Saturday. The Seminoles, like the Hurricanes, looked flat passing the football for the majority of the first three quarters. Blackman looked rattled and had already thrown two interceptions. But after a heated dispute with his head coach Jimbo Fisher, that all changed. Blackman responded by completing nine of his 10 passes in the fourth quarter for 144 yards and two touchdowns. But it just wasn’t enough. Blackman finished 17-28 for 203 yards, two touchdowns and two interceptions. The Hurricanes’ offense struggled immensely to move the ball for most of the contest. Rosier, who finished 19-44 for 254 yards with three touchdowns and one interception, had a difficult time finding his receivers early. He either missed them or threw the ball a second too late. Miami All-ACC running back Mark Walton was not much better. Clearly plagued by the ankle injury that has bothered him for two weeks, Walton managed just 25 yards on 12 carries. Both defenses made big plays – a combined 15 tackles for loss, seven sacks and three turnovers forced – but Miami’s front seven just could not hold Florida State’s running backs, allowing multiple wide open holes at the line of scrimmage. FSU’s power combo of running backs Jacques Patrick and Cam Akers combined for 212 yards on the ground, with a handful of explosive runs including a 46- and a 34-yard rush. The Seminoles were considered one of the best defenses in the country coming into the season. After a rough first three games that pulled them out of the top-50 rankings in total defense, the Noles showed exactly why they received so much preseason attention. Florida State held Miami to just 83 total rushing yards and held Rosier to under 50 percent completion on his passes. But the Hurricanes just made one more big play, and there was no time left for the Seminoles. The undefeated Canes will return home to face the Georgia Tech Yellow Jackets on Saturday, Oct. 14, at Hard Rock Stadium. Kickoff time is to be decided. – Hurricane Irma forced both teams to postpone the matchup from its original scheduled date of Sept. 16. – Miami came in as three-point favorites. – The past three years, each matchup was decided by fewer than six points. This game was no different. – Berrios becomes the first Hurricane to catch a touchdown pass in each of the first four games of the season since Reggie Wayne in 2000. – Berrios currently leads Miami wideouts with 282 yards receiving. – Miami safety Jaquan Johnson totaled a career-high 12 tackles. – The Seminoles’ seven-game win streak against the Hurricanes tied for the longest in either team’s history in the rivalry. From 1963-72, the Noles won seven in a row. – In the fourth quarter, both Walton and freshman guard Navaughn Donaldson limped off the field with leg injuries. Neither is confirmed, but Walton looked like he aggravated the ankle injury he has been dealing with for two weeks.